Almost everyone is familiar with the health benefits of nutritional yeast. Maybe you've tried it on popcorn - if not - do! Or maybe you've used it in soups or sauces. 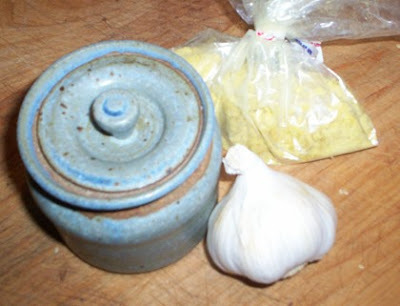 Today I'm going to share our family's favorite way to use nutritional yeast: Hippie Butter! My kids started calling it this years ago when they became convinced that "we eat like hippies." That's another post though! This slightly nutty, almost cheesy-tasting spread is super easy to make and is delicious on almost anything you would normally use butter on. Plus, it has the added health benefits of garlic and olive oil as well! It's a fantastic alternative for people who can't have dairy. Hippie Butter is also a great way to get raw garlic into your diet. In a small jar, combine equal parts Extra virgin Olive Oil & Nutritional Yeast. Stir well and adjust to achieve the desired consistency. Next add 1 clove of finely minced garlic and a dash of tamari. Stir well. You can adjust the flavors as desired - we go for more garlic, especially for mashed potatoes! Nutritional yeast is not the same as active yeast that is used to make bread rise. It is super high in the b-complex vitamins and is a great source of B12 for vegetarians. Nutritional yeast contains selenium, chromium, 18 types of amino acids and helps maintain healthy intestinal flora. Please share your favorite way to use nutritional yeast! We are going to try this! I bet it's good on toast? We love nutritional yeast on popcorn and sprinkled over steamed broccoli. I sometimes stir it into gravy too. I love the name hippie butter! tee hee. Never heard of nutritional yeast? I think you have a lot to teach me! This sounds delicious! I am definitely going to try making it. Thanks for the recipe.